Place 4 bratwurst links in a pot over medium heat and add beer (12 oz). Cook until the beer is evaporated, turning the brats once halfway through. Once the beer has cooked off, add 1 tablespoon of olive oil over the bratwurst then flip and add the second tablespoon of olive oil. Cook until the bratwurst skin is nicely browned and crispy. Remove the bratwurst links from the pan and let cool. Cut into 1-inch pieces. Separate crescent dough into triangles. Cut each piece in half again, lengthwise. Place a bratwurst piece on each piece of dough, on the wide side, then top with a piece of cheese. Wrap dough triangle around each piece of bratwurst and cheese. Place on an ungreased cookie sheet. Bake for 12 to 15 minutes or until dough is golden brown. 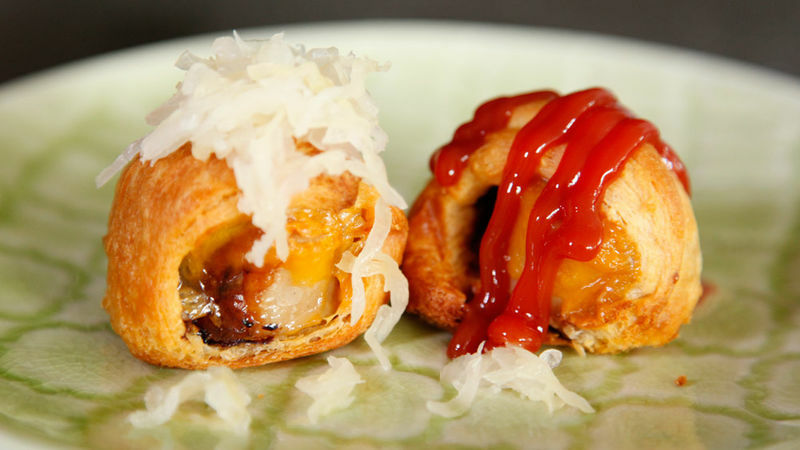 Switch it up by adding your favorite cheese in this crescent roll-up. Serve with your favorite toppings, such as sauerkraut, ketchup and mustard, relish or barbecue sauce.